All was smooth, no one was worried about sinking , or about the earth "giving way", until our "Green Bug" entered the scene. This creature who emerged, actually first struck around the 1970s. "Bugs" is the "know All" of climate, the expert on weather. After devoting a decade in the 1970s to predicting that a new ice age was on the way, "Bugs", also known as "Greeny", discovered that they could scare a lot more people by claiming that the Earth was suddenly and dramatically warming instead. It turned out to be a fabulous fund-raiser for one and all ! And what about the "Leaks" mentioned in my previous blog ?? Lets investigate and peep into some very interesting and "eye openeing write-ups, hitherto unpublished, BUT, hidden in the closets. "Obama’s White House has already trashed the leaked British emails as “irrelevant”. Nor are any enquiries likely to impact what Lord Monckton describes as the world’s “class politique”. Why? Because too many reputations, too many research grants, too much power-grubbing, is riding on the anthropogenic global warming horse. And there’s because there’s a deal of money to be made by it leading proponents, too. In early December, Paul Cheeser, special correspondent for the Heartland Institute, revealed that Michael Mann has received around $6 million for his various predictions, models and reconstructions. "In short there are way too many vested interests to admit that the real science just does not prove their case. But then, as Climate-Gate reveals only too plainly, when it comes to unsound claims for AGW, we are often not dealing with real scientists pursuing empirical truth, nor, sadly, with men of high integrity".-- Unquote. When you want to make a dramatic impact, computer model your predicitions. Who cares about facts, when so man people are gullible enough to buy into predictive fantasy? 2. From an article in "Human Events"- Quoting Ban-KIMoon, U.N. Chief. “We have just four months. Four months to secure the future of our planet,” Ban pronounced to the Global Environment Forum -- We are facing “Droughts, floods, and other natural disasters” as well mass social unrest, violence and “incalculable” human suffering, warned Ban. All of which will result, Ban claimed, if the world fails to “seal a deal” on climate change in December.
" With that the UN General Secretary -- Greenpeace note -- jetted off to Norway to draw attention to the melting polar ice cap where, unfortunately, severe weather conditions led to a trip to the North Pole being put on ice. Non-plussed, Ban informed his Norwegian audience: “We may have a virtually ice-free Arctic in 30 years”. Ban did not seem to know that the Arctic sea-ice is half a million kilometres greater in extent than it was this time last year. And his hosts were clearly too polite to inform him that their ancestors were growing crops in Greenland over a millennia ago. Nor did Ban explain why he picked the Arctic rather than the world’s far larger greatly expanded ice mass of the Antarctic"--Unquote. 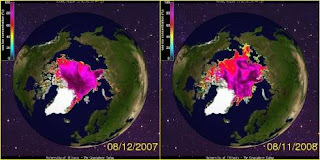 I am putting up Satelitte image of Artic Ice of 2 years enclosed to show this increase. 3. Climate Depot -By Marc Morano. "More than 60 prominent German scientists have publicly declared their dissent from man-made global warming fears in an Open Letter to German Chancellor Angela Merkel. The more than 60 signers of the letter include several United Nations IPCC scientists. "The scientists declared that global warming has become a “pseudo religion” and they noted that rising CO2 has “had no measurable effect” on temperatures. The German scientists, also wrote that the “UN IPCC has lost its scientific credibility. “The IPCC had to have been aware of this fact, but completely ignored it during its studies of 160 years of temperature measurements and 150 years of determined CO2 levels. As a result the IPCC has lost its scientific credibility,” the scientists wrote. “Indeed the atmosphere has not warmed since 1998 – more than 10 years, and the global temperature has even dropped significantly since 2003. Not one of the many extremely expensive climate models predicted this. According to the IPCC, it was supposed to have gotten steadily warmer, but just the opposite has occurred,” the scientists wrote. “The belief of climate change, and that it is manmade, has become a pseudo-religion,” the scientists wrote. “The German media has sadly taken a leading position in refusing to publicize views that are critical of anthropogenic global warming,” they added. This latest development comes on the heels of a series of inconvenient developments, making public opinion to turn against climate fear promotion. "The recent incident of stealing the e-mails of scientists at the University of East Anglia shows that some would go to the extent of carrying out illegal acts, perhaps in an attempt to discredit the IPCC." So, according to Mr Pachauri, let us not concern ourselves with the actual content of the emails and the 'thinking' behind them. These reports ought to be an eye-opener for the wasted billions so far spent fighting a non-existent enemy. One is left to wonder what the money will actually be for - given that sea level rises don't threaten anywhere, the world is already on a downward spiral in terms of temperatures and polar bears are not becoming extinct, and the Maldives are still above water. Could they be for low-energy lightbulbs ? perhaps ! But, again, I must ask a very serious question of our media. Why does it continue to print and discuss about current climate ‘warming’ when it is now widely acknowledged that there has been no ‘global warming’ for the last ten years, a cooling trend that many think may continue for at least another ten years? Why does the media not mention anything about the cooling ?? How can you talk of the climate ‘warming’ when it is not there. Its Getting Cooler ( But Don't Tell the Media). I've only read half of your views on GW and this stuff is eye opening. you HAVE TO write about this on a public platform. please consider writing a book. please do.